I’ve spent some time discussing undertriage and overtriage. I frequently get questions on the “Cribari grid” or “Cribari method” for calculating these numbers. Dr. Cribari is a previous chair of the Verification Review Subcommittee of the ACS Committee on Trauma. He developed a table-format grid that provides a simplified method for calculating these numbers. 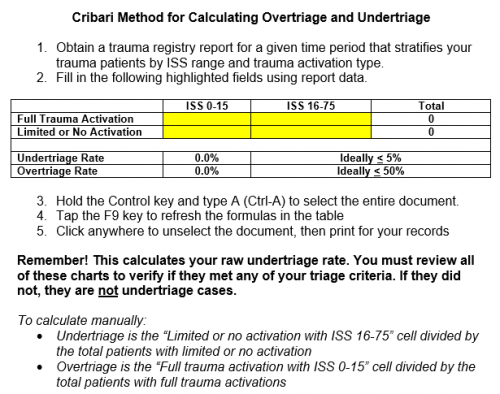 But remember, the gold standard for calculating over- and undertriage is examining each admission to see if they met any of your trauma activation triage criteria. The Cribari method is designed for those programs that do not check these on every admission. It is a surrogate that allows you to identify patients with higher ISS that might have benefited from a trauma activation. So if you use the Cribari method, use it as a first pass to identify potential undertriage. Then, examine the chart of every patient in the undertriage list to see if they meet any of your activation criteria. If not, they were probably not undertriaged. However, you must then look at their injuries and overall condition to see if they might have been better cared for by your trauma team. If so, perhaps you need to add a new activation criterion. And then count that patient as undertriage, of course. I’ve simplified the calculation process even more and provided a Microsoft Word document that automates the task for you. Just download the file, fill in four values in the table, update the formulas and voila, you’ve got your numbers! Instructions for manual calculations are also included. Download it by clicking the image below or the link at the end of this post. Trauma Overtriage: Why Is It Bad? Back in December I talked about the dangers of undertriaging trauma patients (click here to review). What about the opposite problem, overtriage? Values can range from 0% to 100%. The usually acceptable overtriage rate is 50-80%. 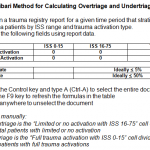 What happens when the overtriage rate is too high? You wear out your trauma team. They are being called for patients with injuries that don’t warrant it. The solution for overtriage? Change your activation criteria, or add a second level trauma response that doesn’t require as many people to respond. This requires a thoughtful analysis of your existing criteria so you can decide what needs to be changed or discarded. The danger? More undertriage. Over- and undertriage go hand in hand. As overtriage decreases, undertriage increases. You need to strike a balance so that the undertriage rate stays below 5%. This makes an excellent performance improvement (PI) program project!